In architecture schools, models are the most direct way for students to communicate their designs so others can understand. The thinking goes: If the design can be physically modeled to scale, it most likely can be built. In this way, models are a way to legitimize design. Of course, there is a long history of architecture being used as a way to legitimize political power (religious buildings, state houses, prisons, etc. ), but before the built structure, there is usually a model to solidify ideas. Known to designers and defined by Jane Bennett (2010:6), models have thing-power, “the curious ability of inanimate objects to animate, to act, to produce effects dramatic and subtle.” Thing-power does not necessarily rely on cultural significance but on the model’s material body. The common wisdom passed down from professional architects to students is that clients love models. The model really sells the project; it is a direct translation from thing-power to capital through its physicality. 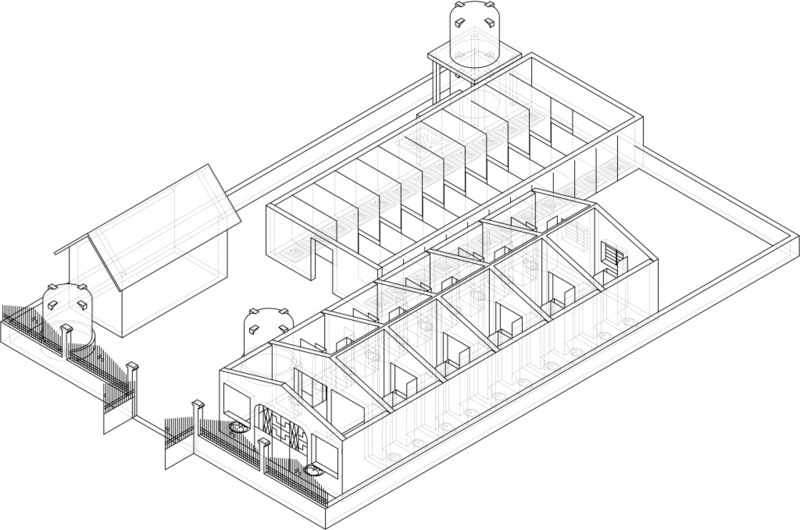 Jane Drew and Maxwell Fry over a housing model to be deployed in Ghana. 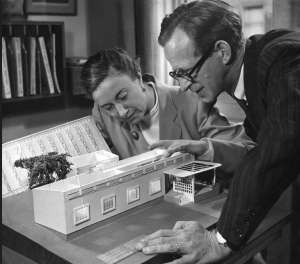 English architects Jane Drew and Maxwell Fry, who worked on the plans of Tema, Ghana’s planned modern city, used models of sanitary and “climactically designed” village units to persuade authorities and villagers of the legitimacy of their design. Though sensitive to climate and villagers’ needs, the project was rooted in the politics of the neocolonial English New Town. When the villagers disapproved of their design, they vandalized the prototypes (Provoost 2017a), lashing out against the models. After independence from England in 1957, Ghana’s new president Kwame Nkrumah let go of Fry and Drew and hired Greek architect-planner Constantine Doxiadis to design a large-scale and fast-paced development for Tema. Doxiadis’s master plan featured a modernist grid slightly on the diagonal to take advantage of winds. Doxiadis’s master plan was to “facilitate social cohesion” among many different communities migrating to Tema for work; however, his plan was rigidly hierarchical, separated by different income classes (Proovost 2017b). Community 9, designed for the poorest, featured a plot of land where migrants could build their own homes. Just north of Community 9 grew Ashaiman, a largely self-organized sister city that lacked formal infrastructure. The Doctor Donkor Model. Xhulio Binjaku. Doxiadis’s hasty planning resulted in the popular solution of what Brenda Chalfin calls “dwelling-based public toilets” (DBPTs). DBPTs are an on-the-ground solution already at work; they provide revenue for the owners, sanitation for workers, and a semi-public space in the city. With Brenda, I made models of the toilet structures for the “Excrementa Estates” installation. In turning DBPTs into models of a kind routinely exhibited in client meetings or commercial sales events, similar to the ones made by Drew and Fry and Doxiadis, we sought to explore and question the role of the model in upholding regimes of power, expertise, and commerce. The Adepa Model. Xhulio Binjaku. Derived from a low place (latrines of Ashaiman) but presented in the mode of high architecture (clean white models with drawings and brochures), the models and the installation for Excrementa Estates are a cheeky attempt to insert existing alternatives into contemporary efforts by architects, urban planners, and anthropologists, among others, to design idealized solutions to poverty. DBPTs are a solution from a difficult place, a radical alternative that provides income, social mobility, and pride in providing what government and its hired architects cannot. Stomach has no holiday model. Xhulio Binjaku. By borrowing the techniques and aesthetics of the architectural proposal, the models for Excrementa Estates—made miniature, stripped white, and affording the viewer a privileged, high point of view—are a critique of the legitimizing power normally held by the architect/expert. The models show radical public–private solutions designed and built by the citizens of Ashaiman in spite of neglect from expert agencies. The models are learning from Ashiaman rather than learning of Ashaiman, a shift in preposition and position. To go low instead of high may contain a powerful lesson for architecture and other forms of planning. Bennett, Jane. 2010. Vibrant Matter: A Political Ecology of Things. Durham, NC: Duke University Press. Provoost, Michelle. 2017a. Tema Manhaen. International New Town Institute. Available at link. ———. 2017b. Tema. International New Town Institute. Available at link.